Skill activation: Flip this card over when you activate this Skill. Effect Once per turn, if you control a Zombie monster, you can place 1 counter on this card. 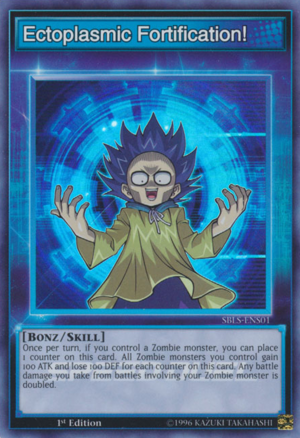 All Zombie monsters you control gain 100 ATK and lose 100 DEF for each counter on this card. Any battle damage you take from battles involving your Zombie monster is doubled. 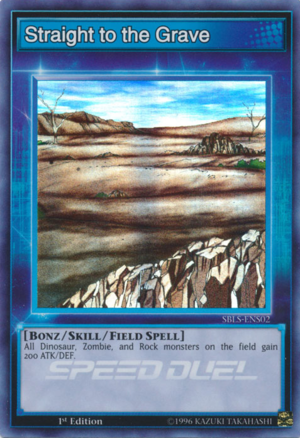 SBLS-ENS02 "Straight to the Grave"
Skill activation At the start of the Duel, place this card in your Field Zone and flip it over.EffectAll Dinosaur, Zombie, and Rock monsters on the field gain 200 ATK/DEF. 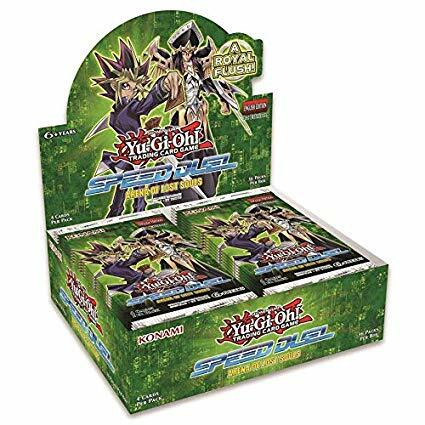 SBLS-ENS03 "Call of the Haunted"
Skill activation: At the start of the Duel, place this card in your center Spell & Trap Zone. 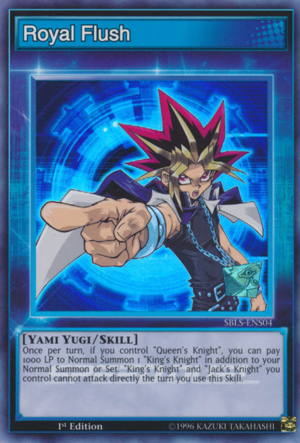 You cannot activate this Skill during your first turn of the Duel. You draw 1 less card at the beginning of the Duel. Effect: Activate this card by targeting 1 monster in your GY; Special Summon that target in Attack Position. When this card leaves the field, destroy that monster. When that monster is destroyed, destroy this card. 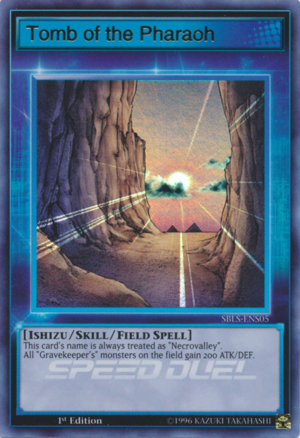 SBLS-ENS05 "Tomb of the Pharaoh"
Skill activation: At the start of the Duel, place this card in your Field Zone and flip it over. 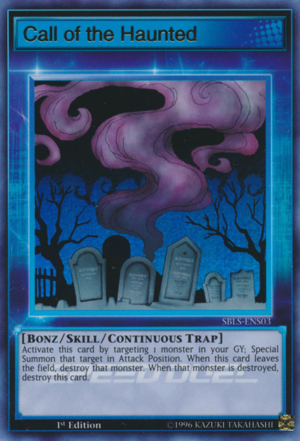 Effect: This card's name is always treated as "Necrovalley". All "Gravekeeper's" monsters on the field gain 200 ATK/DEF.